Ahhh Godeater, one of Scotland’s best-kept secrets. The technical death metal 4-piece have been going hard in the Scottish metal scene since 2016, releasing their first EP Outerstellar and opening for UK Tech Fest on only their third show. And now, the dudes have just released this dual guitar playthrough of their newest single “Exsanguinated”, and man does it rip! 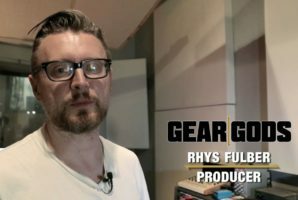 This one’s for all you tech-heads out there, only right here, on Gear Gods! Now as huge fans of tech death here, we’re always stoked when a band blends elements of symphonic and neoclassical styles of music into their heaviest riffage, and that’s one of many things that Godeater are great at. The tune is heavy and technical as hell, but it’s also well-written, as you can tell a lot of thought went into each section of the track. Needless to say, the result is a true banger from start to finish. Drop B (Low to high – B, F#, B, E, G#, C#). You can follow Godeater on Facebook, Instagram, and Twitter, as well as buy/stream “Exsanguinated” on Bandcamp and Spotify. They’ve also got some sick merch available on their BigCartel page, so if you’re feeling especially naked or just want to support the lads, you can do that here. Senior Editor at Gear Gods from Wisconsin living in LA. Just trying to figure this whole music thing out, really.